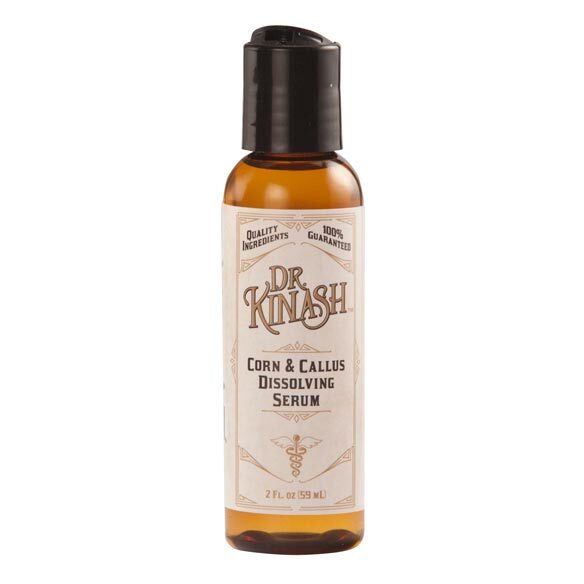 Dr. Kinash™ Corn & Callus Dissolving Serum breaks down corns and calluses to uncover soft, smooth skin. Dr. Kinash™ science-based formulations and ingredients are trusted remedies with guaranteed results. Doctor-inspired callus and corn treatment contains exfoliating glycolic, malic and mandelic acids to break down thickened skin, leaving feet looking younger, healthier and sandal-ready. Proven ingredients help dissolve thick, rough skin. Apply callus treatment liberally to corns or calluses and massage into skin. Natural-based formula is gentle enough for daily use. 2 oz. flip-top amber bottle is easy to use. Water (Aqua), Urea, Glycerin, Glycolic Acid, Aloe Barbadensis Leaf Juice, Hydroxyethylcellulose, Melaleuca Alternifolia (Tea Tree) Flower/Leaf/Stem Extract, Malic Acid, Mandelic Acid, Lavandula Angustifolia (Lavender) Flower/Leaf/Stem Extract, Rosmarinus Officinalis (Rosemary) Leaf Extract, Sodium Hydroxymethylglycinate. Apply liberally to corns or callused skin. Massage well until completely absorbed. For best results, apply twice daily. For external use only. If serum enters eye, flush thoroughly with water. If accidentally ingested, contact a physician. Keep out of reach of children. Sunburn Alert:This product contains Alpha Hydroxy Acids that can increase your skin's sensitivity to sunlight. Use a sunscreen and limit sun exposure while using this product and for 2 weeks afterward. I have thick callus and wanted to try something different. To help dissolve my painful callouses. I'm hoping they will melt away. If they do I'll buy more. After foot surgery and in a cast for 6 weeks feet are a mess and need attention. I need it. I hope it works! this is the first time for me, but I have a lot of corn and callus on one of my feet and I want to try something new and I hope I ordered the right one. I hope to reduce to appearance and fade old corn marks. Need something that would work tried a lot of different stuff sounds like this one might work better. I have corns and calluses. I have a callus on my little toe and it really hurts. I'm hoping this product does what it says and removes the callus. can diabetics use this product ? BEST ANSWER: Thank you for your question. This is safe for diabetics as long as it is used externally only and it is not used on open wounds, or broken or irritated skin. We hope this information will be of help to you.